I grew up with baked potatoes as a staple in our home. My mom and dad taught us to eat the entire potato, skin and all. But it wasn’t until I was a teenager that I was exposed to baked potato soup. I think it was Silver Spoon Café (whose name later changed to American Café) where I first fell in love with potato soup. And then, when I came to college in Nashville, I started eating it at The Cooker. These two versions were different: one more creamy, one more cheesy, but both hearty, warm and like comfort in a bowl! Through the years, I have tried several recipes to find the right one. I have found a couple that I have liked, but then I got a recipe a few years ago that I really, REALLY like. This one is from Julie, a family friend of ours. I have altered a couple of things (lessened the butter and exchanged yellow onion for the green onions). 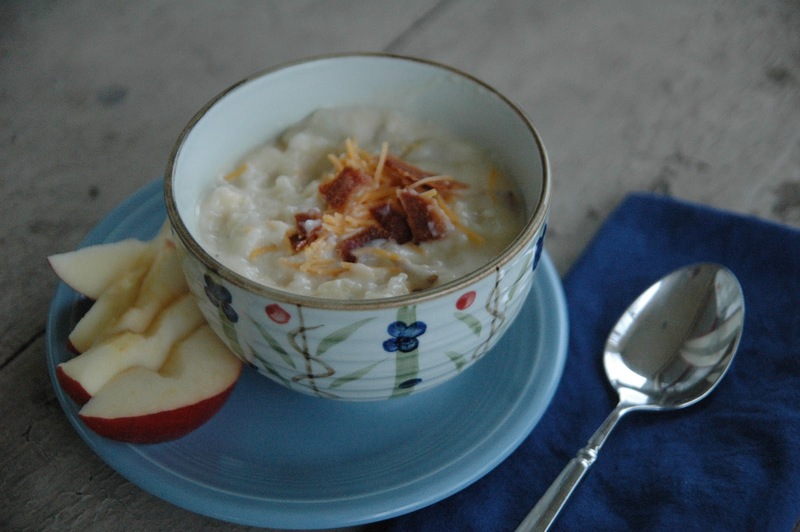 This is a great “go to” soup and one that a cold November week like this beckons. So, I answered the call and made Potato Soup last night. As I was stirring the soup, I remembered an incident in my past that I had with Potato Soup. As I was finishing it up, the soup began to stick to the bottom of the pan. Foolishly, I took my wooden spoon and firmly scraped the bottom of the pan and stirred the soup, which immediately incorporated all of that burnt, blackness right into the vat of creamy potato soup. I freaked out! I started trying to pick the burnt pieces out of the soup, while I shrieked “oh no! oh no!”. The task was not simple or effective. I optimistically thought it might not taste bad if I removed all the charred chunks. I then sampled the soup, which tasted like smokey, burnt potato soup. Nice. And the meal was to be delivered in 30 minutes, of course. So, Dave, in his typical fashion, talked me down off the ledge and helped me think about solutions. The solution that we chose was for him to go to The Cooker and BUY a quart of soup. I didn’t easily embrace this solution for several reasons: I am cheap, I like homemade things and I really like giving enough food so the friends can have leftovers! But in this moment, I needed potato soup pronto and it worked. My friends had dinner and they didn’t have to prepare it. So I learned from this disappointing experience to stay near the soup, stirring frequently and to keep the temp at medium to low OR to cook it in the microwave, as it won’t burn on the bottom when not on a stove top. This recipe can be made with Baked Potatoes or frozen hashbrown potatoes (the square cut ones, not the stringy ones). I prefer using Baked Potatoes as it is cheaper, fresher and you can make extra potatoes for picky eaters at your table who won’t eat soup (hypothetically). However, if you have more money than time, you can save a step by buying the frozen hash browns. You make the call. Bake at 400 for 45 minutes to 1 hour depending on size of potato, until tender when pierced with a knife. The skin is so yummy! Bake potatoes. Melt 1 stick of butter in a pot. Add onion and sautee until onions are clear. Add the flour and milk and stir until it begins to thicken a little. Add baked, peeled, chopped potatoes, salt, pepper and bacon. Stir until incorporated. Add cheese. Cook until thoroughly heated. Stir in sour cream. If the soup is too thick, add milk. Garnish bowls of soup with a sprinkle of cheese (and a crumble of bacon if you’d like). I have a silly question for you. Does salting the outside of the potatoes while you bake them actually flavor the potato? In the directions you say to peel them right? I'm just wondering, because I would not have thought to salt them to bake them if I wasn't using the peeling in the soup. Love your blog! Thanks for writing! Susan, not a silly question. In fact I thought about it as I was writing the post and didn't go into it because I felt like I was writing too long! I don't know for certain, but my sense is YES it does give the potatoes more flavor when they are salted and baked. But absolutely optional! 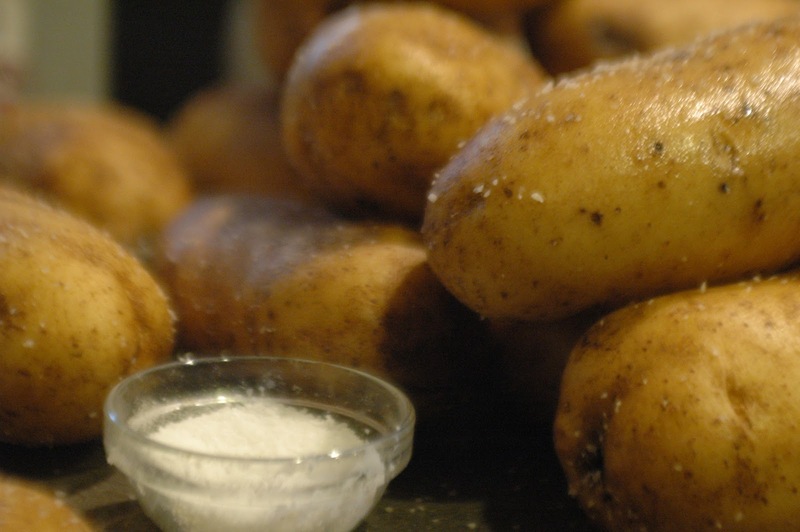 I primarily gave the salting-the-potato-tip since we were on the subject of baked potatoes! Glad to hear from you. Hope you and your family are doing well. This sounds divine! I have to run to the grocery store anyway so this will be on the menu tonight or tomorrow. It sounds like it'll be a classic fall soup, which seems silly on a day of such sunshiney weather but it's November regardless. Well, I ended up not making it over the weekend but tonight instead. It was worth the wait! Definitely a new favorite recipe.